Panno Sign is a signage typeface developed for the romanisation of street names in South Korea. Since these signs can contain up to three different notations for one name (in Korean, Chinese and Latin) one of the main issues was space saving whilst maintaining optimal legibility. To achieve this Panno has narrow proportions, a very large x-height and surprisingly open counters. The design of Panno can be characterised as simple and robust with little difference between its thickest and thinnest parts. Panno can serve as a perfect replacement for DIN in situations where the latter might feel too constructed or too cold. 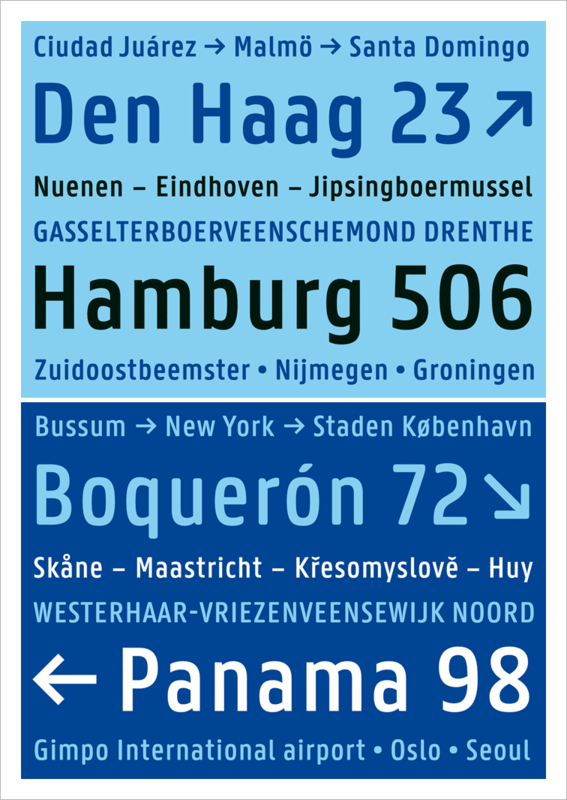 This one weight typeface is available in two styles (Normal and Rounded). Every style is available in two versions (Negative and Positive) to produce the same optical weight when used in negative and positive conditions respectively. Panno Sign sports an extended Latin character set and various OpenType features that give access to fractions, different styles of numbers and alternative versions of glyphs. For other applications than signage you might prefer Panno Text.